MONCTON, NB – Allan Luke Larin, age 67, passed away on, Thursday, April 11, 2019 at The Moncton Hospital after a brave battle with Cancer over the past three years and five months. Born on November 26th, 1951 in Quebec City, he was the son of Louis E. Larin and Marie Aurore Alice Vikers. He is survived by his wife and beloved "Nut" Melba Long; daughter Julie; son George (Janet) and cherished grandson Noah. Allan was the ninth of eleven children. He is survived by his brothers and sisters; Dawn Larin, Sylvia Floyd (Earl), Sandy Wile (Walter, late), Christine Sabourin (Micheal), Danita Polzer (Douglas), David Larin (Louise), Steve Larin (Linda), Robert Larin (Collette, late) and predeceased by Ida Bedard (George) and Carol Serjeantson (John). He will be missed by many nieces and nephews. 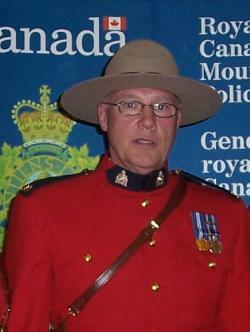 Allan served as a member of the RCMP for 36 years with all of his service being in New Brunswick where he made many close friends from Newcastle, Oromocto, Fredericton, Moncton, Fundy and, of course, Richibucto which he considered his second home. During his service with the RCMP, he was a recognized as a distinguished Sharp Shooter, awarded an Accommodation for Bravery, received The Queens Medal and served as RCMP liaison to Block Parents of New Brunswick for many years. Where ever Allan went he made a friend. When he met someone new he would ask their name, shake their hand and they would be a friend for life. Always greeting people with a smile and hand shake, his charisma made him memorable to all who met him. He found great joy as a Dad and shined his brightest as a Grampy to Noah. He was the best tree climbing, ice fishing, leprechaun hunting, skating buddy, play by play announcer and cheer leader a boy could have. He was a "Gentleman, Scholar and a Connoisseur to the needs of others." Visitation will be held at Thompsons Funeral Home Richibucto, NB on Monday, April 22 , 2019 at from 2-4 & 7-9. Memorial service to be held at a later date in Quebec. In lieu of flowers, donations can be made to the Ambulatory Oncology Clinic at The Moncton Hospital. Contact the Friends of the Moncton Hospital www.friendsfoundation.ca/donate To leave online memories or condolences please visit: Thompson Funeral Home Richibucto, NB. Arrangements are in care of Thompson’s Funeral Home, Richibucto (523-4252). Ambulatory Oncology Clinic at the Moncton Hospital or Friends of the Moncton Hospital.